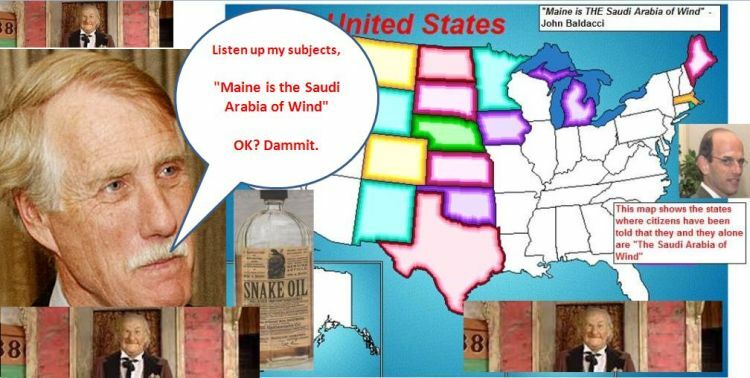 C’mon Angus, how can you look the people of Maine who trusted you straight in the eye and tell them that they are living in the Saudi Arabia of Wind, when you know that this same line is being told to residents of at least 14 other states? Come-on lines like this appeal to the greed in people in hopes that they drop their guard and suspend the use of common sense. You see the same thing in those emails from Nigeria that tell you they have found millions owed to you and they will transfer them to your bank account if they can just get your bank account information. We expect this from such seedy sources, but we expect much better from persons who have taken the oath of office. It calls Quebec the Saudi Arabia of wind energy. Scotland has been estimated to have 25 per cent of all Europe’s wind; it is the “Saudi Arabia of wind”, as Scottish Renewables, the industry association, has described it. including a vast stretch of Inner Mongolia that could be the Saudi Arabia of wind power.